ENCINITAS — Five years ago, Claire Winer moved to Seacrest Village Retirement Community in Encinitas. 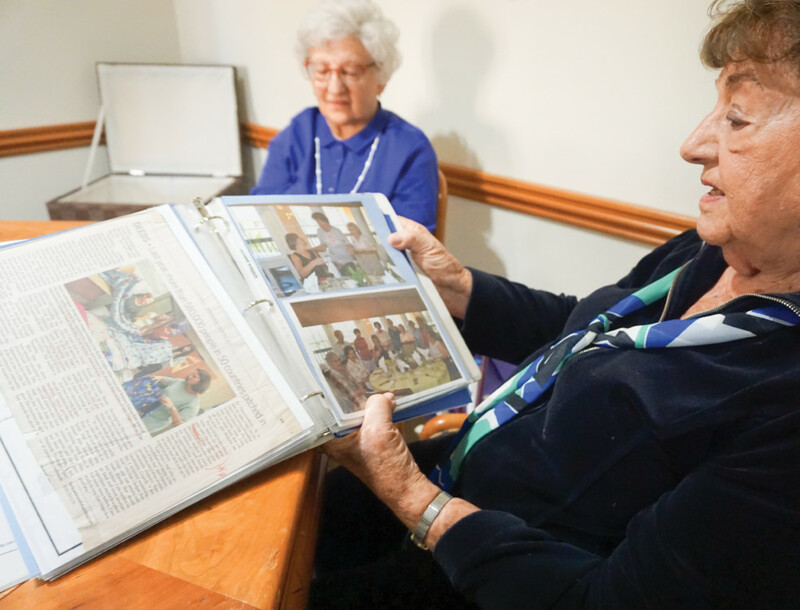 With short brown hair and a thick New York accent, the spunky 92-year-old quickly sought out a fun way to socialize and pass the time. A year later, the knitting club was born. 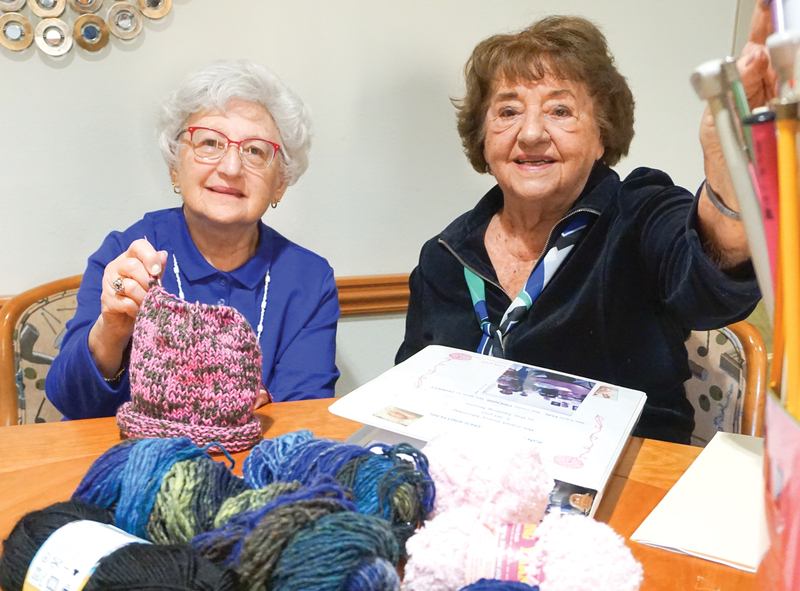 Eighty-eight-year-old Ruth Segel, another Seacrest Village resident, joined the knitting group almost immediately after she moved in three years ago. She holds up a project she’s working on — it’s a tiny pink hat with flecks of green yarn and a hole in the top for a pom-pom. Every Monday at 1:30 p.m., Winer and Segel join about 18 other women ages 80 to 100 in a cozy parlor on the bottom floor of the Seacrest Village main building. Balls of yarn — donated by the North Coast Knitters Guild — and a tin of knitting needles cover the tables, with trays of cookies and pots of coffee peppered between them. Since 2014, the group has collectively knitted nearly 1,000 items. Every hat, scarf, muff, blanket and other hand-knit piece is donated to a local charity. The women have sent items to Rady Children’s Hospital, Emilio Nares Foundation, Alzheimer’s support groups, members of the military and women’s shelters, to name a few. Winer and Segel said they love this part of the work. “You’re giving so much, and no effort really. Just your time,” Winer said. “Right?” She glances at Segel, who is fastidiously knitting on the other side of the table. “Right!” Segel nodded, briefly pausing her work on the pink hat. Jon Schwartz, director of community relations at Seacrest Village, said the work of these women goes against a common stereotype of seniors. Typically, folks assume they become greedier with age. With the Knitting Club, Schwartz sees the opposite effect. The club also helps integrate newcomers into the Seacrest Village Community. Schwartz explained that Winer, who is part of the welcoming group, will always ask a new resident if they knit. Even if it’s been years since they last picked up knitting needles, Winer gets people involved. 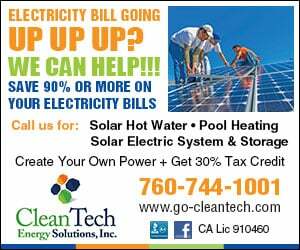 “It’s as though she encourages everyone to come in, and they pick it right back up,” Schwartz said. And that was exactly how Segel came to the group. For many, the group is an opportunity to knit, contribute to a great cause and just hang out. Winer said sometimes, even those who don’t knit come by to have a cup of coffee and say hello. The group has become the highlight of their weeks — even in the face of health challenges, many still try to be there, Winer explains. The women of the Seacrest Village Knitting Club will celebrate their 1,000 completed pieces on Dec. 24 with a small party at their main building. They’ll have treats, a slideshow with photos of their work and a guest speaker. Winer — who shares that she loves to throw a good party — wants to say thanks to her ladies and celebrate this activity they love.